Every historic home needs a little TLC. Every year, for the first 2 weeks of the year, Montpelier is closed for annual maintenance to complete projects like painting, necessary repairs, and installations. Preservation Technician, Chris Warring, measures the location of a painting in the South Passage. Jenn Glass. The Montpelier Foundation. This year was an especially busy time for our team, led by Director of Architecture & Historic Preservation, Jenn Glass, and Curator of Collections, Teresa Teixeira. This January, the departments first teamed up to prepare the rooms where new furnishings were slated to be installed by taking on projects including plaster repairs, applying a fresh coat of limewash, and mapping out hanging locations for the paintings in the South Passage. Preservation and Curatorial teams perform annual maintenance and updates at James Madison's Montpelier. Jenn Glass. Courtesy of The Montpelier Foundation. Phase two called for installing new wallpaper and carpets, all based on physical evidence found during the 2008 restoration of the House. The new Venetian carpet in the South Passage is an exact reproduction based on an extant sample from the period, and was installed based on tacking evidence. The changes made in 2018 are the biggest visual change to the Madison house since the official completion of the restoration in 2009 (though it was unveiled to the public in 2008). During the 5 year project from 2004-2009, the house was stripped of it's pink, duPont-era stucco, and returned to represent the Madison retirement period, removing 2 full wings and reducing the room number from 55 to 33.
duPont-era Montpelier house. This house had 2 large additions on either wing and 55 rooms. The pink color was stripped in during the 2008 restoration and the house was restored to represent the Madison retirement-era. Courtesy of The Montpelier Foundation. The process of filling the South Passage gallery requires the combination of a historical database and guest accounts. In order to be considered for inclusion in the South Passage, a painting not only has to match a description on the inventory, but also has to fit the description from guests of the Madison's we have on file. "One guest described the paintings in the space as 'paintings of various merits and demerits,'" says Teixeira. "So while we are limited to old-master-style oil paintings, we can include early-19th-century copies of older works." "To the right is a very broad passage with a waxed floor,—wainscotted, and hung, so as to conceal the walls very nearly, with paintings of various merits and demerits." The artwork has been acquired from all over the world, though we have yet to find all of the pieces. Instead of blank wall space, frames with descriptions of the artwork hang alongside acquired paintings to represent those we haven't yet obtained. Unfilled frames in the South Passage. Kendall Madigan. The Montpelier Foundation. The text in the middle frame reads "the persecution of the saviour." Using the 1844 "Oil Paintings at Montpelier" inventory and guest accounts of the artwork in the passage, were were able to find a representative piece of art and hang it in place of the empty frame. Teresa Teixeira, Jenniffer Powers, and Tessa Johnstone hang a newly acquired painting in the South Passage. Jenn Glass. The Montpelier Foundation. Based on what we know of the Madisons we were able to narrow our search to art that was available for purchase in the markets that John Payne Todd visited during his unofficial Grand Tour. While on a diplomatic mission to France and Russia, Payne regularly disappeared for long stretches of time, during which we presume he did the bulk of his art purchasing. Finding a particular painting involves extensive browsing through auction catalogues. So far, we have acquired paintings from Sotheby’s US and UK, Christies NY and London, Koller Auctionen, and other small auction houses both domestically and abroad. Paintings lining the South Passage of the Madison house. Jenniffer Powers. The Montpelier Foundation. 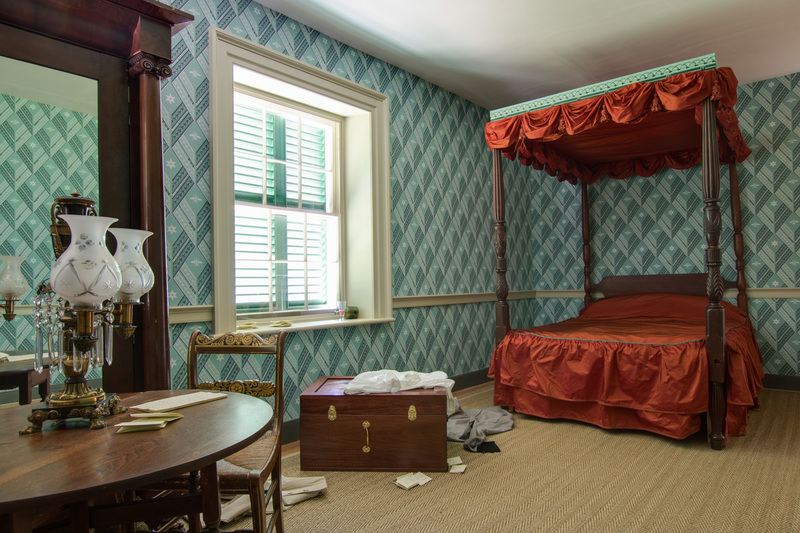 Madison's stepson, John Payne Todd's room was furnished to interpret him staying at Montpelier. The wallpaper in the room was based on a combination of physical and contextual evidence. During the 2008 restoration, we found a small fragment of the original wallpaper behind the mantel. Paint analysis revealed that the wallpaper was a light, greenish-blue color. The pattern we ultimately chose is a French pattern that was found in Boston (and thus available in the American market). Since Payne spent a significant amount of time in France this was an appropriate choice to help tell that story and accurately interpret the space. New wallpaper adorns Payne Todd's bedroom. Jenn Glass. The Montpelier Foundation. The bedhangings were also based on physical evidence—this time from a rat’s nest. Within the walls of the Madison house, we found a nest rife with bits and pieces of fabrics from all over the home. By cross-referencing what was in this nest with inventories and the historical record, we were able to accurately recreate the living spaces with the same types of fabric. This silk taffeta is woven in one direction with red and another with buff-colored thread, causing the fabric to change color as it wrinkles and folds. The fragment on which it's based is on display in the Restoration Room. The design of the hangings is based off of one found in an upholsterer’s guide book from the period, and the bedding was constructed by hand in-house. The grass matting on the floor is also based on a large piece found within the wall. Payne Todd's new-look bedroom with updated wallpaper and bed hangings. Jenn Glass. The Montpelier Foundation. According to both period accounts and Payne’s personal journals, he had a widely-known and well-documented drinking problem. Thus, we’ve added several bottles to the room, reproduced off of ones found archaeologically on the property. He would apparently sometimes go days without leaving his room, so we’ve illustrated that by how disheveled his space looks compared to the rest of the house. The carpet installed in the space is a flat-woven carpet called Venetian. Venetian carpeting, made throughout England and in major American cities, was a type of striped, wall-to-wall carpet that was often used in high-traffic areas such as passageways, dining rooms, and other public spaces. During this period of the Madisons’ life, Dolley wrote to friends asking for “2d hand Carpets—or Carpetting at Oction cheap,” and at least one response contained an offer of Venetian carpeting. Venetian carpeting on the stairs leading to the second floor of the Madison house. Kendall Madigan. The Montpelier Foundation. Once we knew we wanted to install this style carpet, we set about researching images and extant period examples. Both of the designs we ended up having woven—on the North Stairs as well as in the South Passage—are copied from extant carpet fragments in the collection of Old Sturbridge village. We contracted Thistle Hill Weavers to create exact reproductions using the same materials and natural dyes, so the carpets appear exactly how they would have during the period. Up close of the Venetian carpet. Kendall Madigan. The Montpelier Foundation. During the Madison’s period, the carpet strips, each about twenty-four inches wide, would have been stitched together and the seams would have been tacked to the floor. However, since the floorboards in the South Passage are original to the Madison period, we had to install the carpet without adding new tack holes. Each new hole added both convolutes and destroys physical evidence of the Madison period, so when we installed new carpeting, we attempted to either avoid any tacking or tack between the floorboards. In this particular case, after sewing the strips together, Peter Meade of Four Quarter Carpets in Orange, VA, attached the carpet directly to the carpet pad, creating what is essentially a tightly-fitted wall-to-wall area rug that does not tack to the floor at all. The combination of tight fit and the rubberized mat keeps the rug from slipping and stretching while preserving all the physical information found in the original floors. Venetian carpeting being installed. Jenn Glass. The Montpelier Foundation. 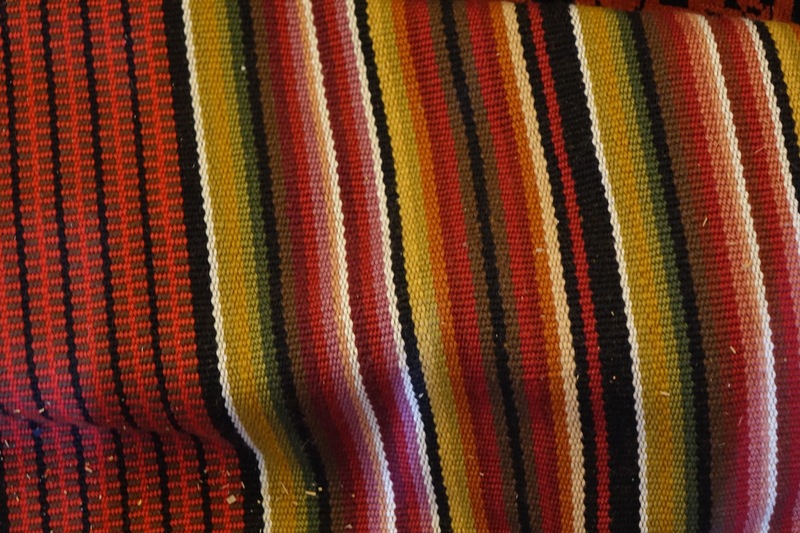 The adjoining floor cloth is installed in a similar, non-invasive manner and is based on physical evidence found during the earlier restoration. A small, fingernail-sized fragment of a painted floor cloth was recovered from underneath the doorway to the dining room, indicating that the cloth stretched wall-to-wall. Microscopic paint analysis revealed that the original colorway consisted of a rust red with cream and mustard-yellow. 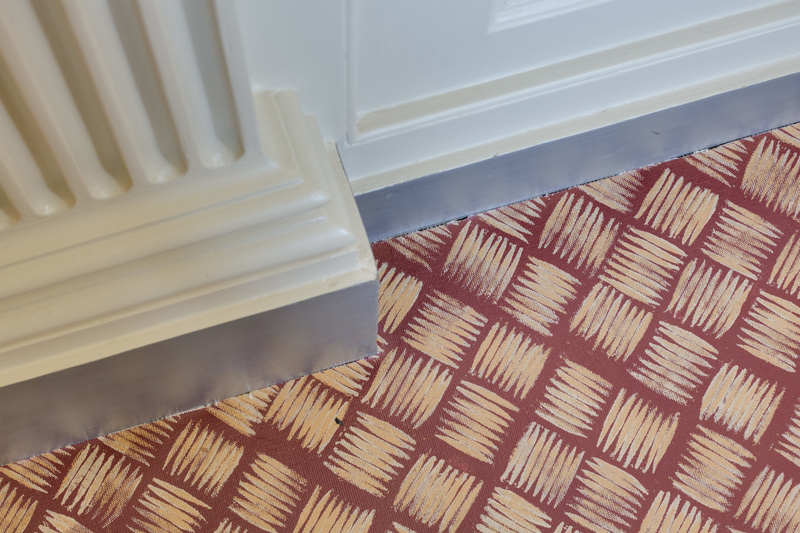 With further research, we learned about a much larger fragment from the same period and in the same colorway at Historic Kenmore Plantation in Fredericksburg, VA. We adapted the design of the Kenmore fragment and commissioned a custom floor cloth from Canvasworks Designs. New floor cloth recently installed in Madison house. Jenn Glass. The Montpelier Foundation. It's vital that we represent our physical spaces as accurately as possible. We are constantly finding new evidence that offers insight into the lives of Madison and his family. This new information continues to influence how we furnish and update the house and grounds, and thus our interpretation of James Madison, and his family's, influence on America's founding era. Because we constantly strive to make the house as accurate to the period as possible, installations change whenever we discover new information. From changes as large as carpets to as small as a teacup, there will always be something new to see at Montpelier.